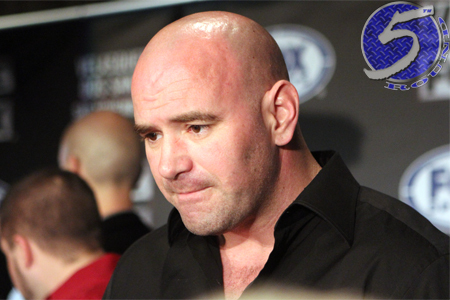 Back at UFC 96 in March of 2009, UFC president Dana White (pictured) promised he would never raise the cost of his pay-per-view shows again after bumping it from $39.95 to $44.95 (standard definition) a couple of years prior. “I’ll f****** go on record right now and say I will not raise pay-per-view,” White previously stated. “I won’t do it. Well, fast forward nearly five years, past 70ish UFC PPV events and the biggest rematch in MMA history is changing all of that. The cost to order “UFC 168: Weidman vs. Silva II” on DirecTV, America’s largest cable satellite provider, has jumped five bucks to $49.95 ($59.95 in high definition). The price tag is the same for Time Warner customers. However, to stream UFC 168 on UFC.TV, the price currently remains unchanged at $44.95 (SD) and $54.95 (HD). Could the UFC be trailblazing a new path in the PPV lane? By understanding that technology like Apple TV and Chromecast allows viewers to shoot whatever they are streaming on their computer, smart phone or tablet directly to their television, they could ultimately cut out the middlemen (DirecTV, Time Warner, Dish, etc.) and save costs to put on their paid shows. UFC officials did not address the price hike when contacted by 5thRound.com, but it is believed it won’t last beyond UFC 168. The bright side for MMA fans is at least they’re not dropping $75 (HD) like boxing enthusiasts had to for September’s Floyd Mayweather vs. Canelo Alvarez match. However, that day might not be too far away. UFC 168 goes down inside MGM Grand Garden Arena in Las Vegas. Former middleweight king Anderson Silva looks to reclaim his throne against champ Chris Weidman in the night’s featured attraction.